The Drowned Earth have just shared another couple of paintjobs I did for them so I guess it’s only right that I pop them up here on the blog, with some bonus photos from different angles. First up we have Sage. He’s a giant intelligent gorilla chap, technically a Berengi in Drowned Earth lore I believe. I loved painting him as there’s something so unusual and thoughtful about his sculpt. Traditionally the gorilla would be the big heavy bruiser in a skirmish game but here we have one who seems to be inquisitive and curious to learn more about the world – fitting for the Artifacters faction. I was especially happy with the expression on his face (did I say how much I love painting faces on minis?) and also the little gecko fellow in his hand. Next up we have Kaneda, the faction leader for the Firm. I believe he’s a bit of a gangster and as you can see he’s got some Yakuza tattoo stuff going on – as inspired by his original concept art. His clothing was an interesting challenge as I originally over-highlighted the folds and it was just a bit too overpowering. I glazed it back down and found it worked way better. I could perhaps have brought it back further but those folds are really prominent on the sculpt. I was a little daunted with it but once I’d researched the design I wanted to go for I knew it was just about getting on with it and tidying/adjusting as I went. The oni face on his upper arm didn’t quite come out as I envisaged but I think it works nonetheless. Happy enough with the koi over his chest and I think the overall effect is what I was aiming for. I’m also really happy with the vein on his forearm. Just that little green glaze and shadow line helps to bring out that sinewy character. It’s the little things! In case you missed the live session and wanted to watch me paint a Drowned Earth miniature, you can catch the two hour recording over on the Drowned Earth Youtube channel. 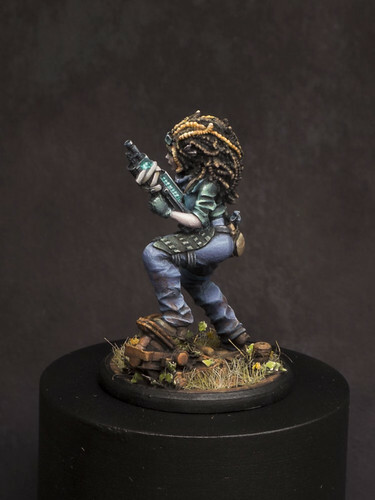 In this two hour live-stream I chatted with Drowned Earth creator James and occasionally daubed a bit of paint on one of the studio miniatures. We covered a lot of topics, touching on things like colour theory, painting techniques, brushes, paint brands, paint consistency, making a wet palette, and so on. To be honest I should have been more of a multi-tasker and actually focused more on painting while I talked. For a first attempt, though, I was pretty happy with the way it came out. I’ve had some great constructive feedback and I can see many ways to improve for my next one. Given the technical difficulties I had to overcome to be ready for the live session, I’m pretty chuffed with what we broadcast in the end, though. I had various issues such as a major panic on discovering that my video camera was incapable of live digital output, meaning I had to switch to my iPhone and use that as a stopgap webcam (sadly without zoom, exposure, white balance or aperture controls). Also, I discovered that my upstream broadband speeds are just not high enough for steady 720p streaming, which resulted in some unfortunate buffering. Probably means I will be sticking to recorded sessions in the future, until fibre becomes available in my area and I can upgrade to something faster. It was my first time using Open Broadcaster Software (OBS) to set it all up and I have to say I was impressed with it. A nice and simple way to combine multiple video and audio sources together into one stream – in our case it was video from my webcam iPhone, a second webcam over the palette, audio from my microphone and additional audio from James calling in on a Google Hangout. So a far from perfect first attempt, but I had fun and the two hours flew by. I could happily have gone on longer – if it wasn’t for an audio glitch in the last few minutes that made James sound like a dalek! More painting while I talk! Better depth of focus – webcam proximity and lack of aperture control meant I only had about a centimetre of focal range. Keep the mini in shot – I was wary of this and noticed it happening often. Bring the mini closer – I think the power of this sort of video is in getting right in close as if the viewer was painting it themselves. No buffering/stuttering – probably avoid live-streaming til I have a decent upstream rate. Better setup over the palette – need to upgrade that crappy old webcam and maybe make the image a bit smaller. If you watched it and have any feedback or requests for content you’d like to see me cover then do drop me a note in the comments; I am looking forward to recording more video content in the future and I want it to be great viewing and relevant. Work continues on the Drowned Earth miniatures. The game is now into the closing stages of the Kickstarter and has been smashing through its stretch goals, exceeding James’s expectations. It has been great to see the community growing around the game, on social media and in the comments section of the Kickstarter page. People’s imaginations seem to have been sparked by the rich setting, the beautiful miniatures and the narrative gameplay style. The excitement around the game was palpable at Salute a couple of weeks back where we had set up a fantastic display area with some beautiful display boards. I was in attendance to chat with anyone interested about how I had painted the minis and despite not planning to spend the whole day on the stand, ended up staying there most of the day. I’d finished Mirja and she was proudly on display with the previous three (Nix, Venk and Slethsk) for folks to get a close look at. Quite a technical mini to paint, this one, with significant object-sourced lighting (OSL) from the flames, the flames themselves, and non-metallic metal effects on the brass tanks. I’m pretty happy with how all three of those aspects came out. Being picky I could probably point out some inconsistencies with the lighting effects where it’s not behaving entirely realistically but I feel like it’s serving its purpose to be dynamic and eye-catching. Talking of dynamic, her pose actually makes it hard to capture everything from one camera angle – for example, the upper gout of flame obscures her face when viewed from the front – so to give a good sense of the three dimensional composition I thought I’d throw together a little animated gif. Hope it works in your browser! Now, in other news, I will be livestreaming some painting on the Drowned Earth YouTube channel this Tuesday, May 9th, at 19:30 UK time (GMT+1). Last week sculptor James Cain showed us his process for digitally creating a Kickstarter unlocked stretch goal of faction leader Kaneda riding a giant preying mantis. It was amazing to see James at work, effortlessly sculpting a creature out of digital clay before our eyes, and creating a stylised skull in seconds, without any pictorial reference. Fascinating stuff, and I encourage anyone interested in how modern digital miniatures are created to go watch the recording on the channel. Anyway, this will be the first time I will have recorded or streamed anything like this and – whilst I am slightly nervous about the technical setup – I’m super excited to share my painting process with a wider audience as I am hoping to create more video content in the future. 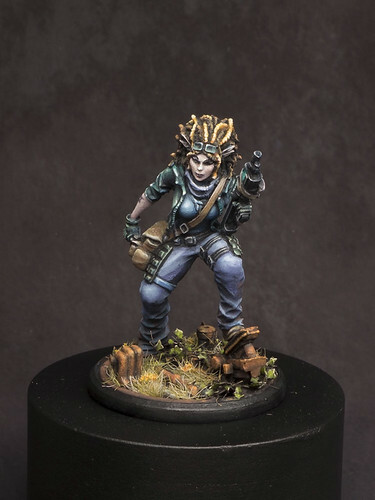 So it’s time to break the silence again here on the blog and to talk about an exciting project I’ve been involved with, namely the brand new narrative skirmish miniatures game The Drowned Earth, currently smashing through stretch goals on Kickstarter. James, creator of the project, is a good friend of mine and it has been fantastic to see his game evolve this past year or so and finally become a reality. He’s got such a strong vision for both the setting and the narrative swashbuckling style of gameplay and I’m so pleased to see it finally take wing, so I encourage you all to head over to the website or Kickstarter page and get involved. 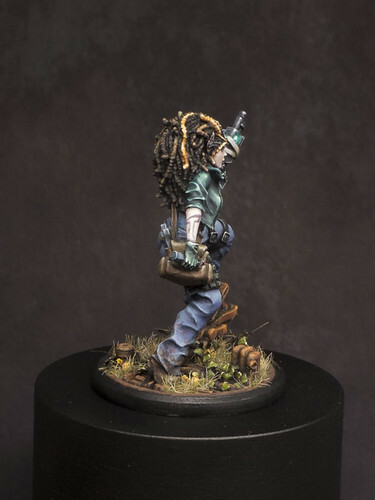 For my part, I’ve been painting minis for him and it’s very gratifying to see them featured on the KS campaign and on news sites like Beasts of War. The first I painted was a lizardman Indiana Jones type character called Slethssk, a scout for the Artifacters faction. As with a lot of the Drowned Earth minis, he’s got a lot of character and a dynamic pose. I wanted to ensure his scales were visually interesting, beyond basic texturing, and after researching various lizard and iguana colour schemes from nature, I chose to add a hue shift to purple at his extremities, as well as that shock of orange along his crest. Pleased with how it came out. I’m also especially happy with the NMM highlighting on the revolver. Often I use a blue-grey on weapons – eg the Infinity stuff I’ve painted – but chose to shade here with black and Vallejo Panzer Aces 337 (German Tank Crew Highlight) up to Vallejo Model Colour 986 (Deck Tan). Next up was Papa Venk, a medic/sniper for the Firm faction. He’s covered with loads of little details and trinkets – so many feathers, bones, horns, pouches and vials all vying for attention – so I had to be careful not to overload him with colours and avoid him appearing too busy. And the final piece for this update is Nix, faction leader of the Artifactors. Clearly a sassy Lara Croft vibe going on here. Again the sculptor has managed to add some dynamism to a fairly straightforward pose – with the angle of the hip, the slight tilt of the bow and the arm reaching back to the quiver for the next arrow, giving a real sense that she’s been caught in mid motion. Really enjoyed painting her, going for a little bit of texturing on the leather trousers and if you look closely you’ll see a few freckles on her cheeks, inspired by the original concept art. Also, as with Slethssk, I’ve been having a lot of fun giving these minis a jungle/swamp base with some brass etch and paper ferns. 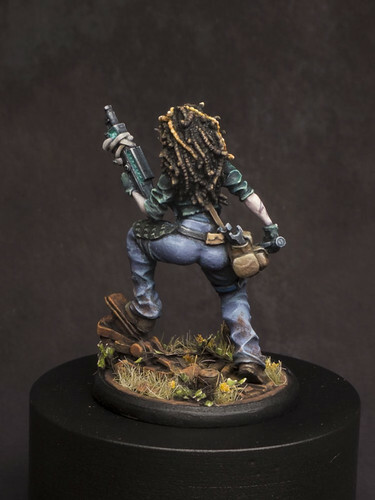 For those interested, I painted these with a Rosemary & Co Series 33 (Size 0), my go-to brush for minis at this scale. That’ll do for this update. 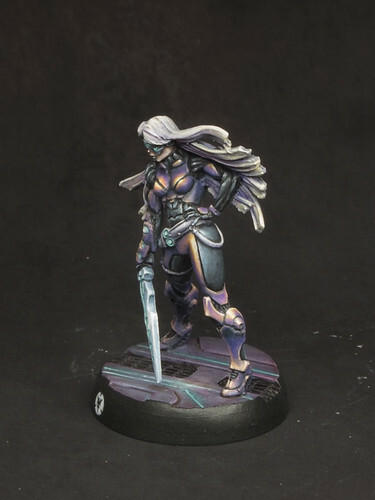 Watch this space for more previews of the Drowned Earth minis (I’m working my way through both the Firm and Artifactor starters right now) and do please head on over to check out the Kickstarter campaign. Next weekend is Salute where I’ll be in attendance and supporting James at the Drowned Earth stand, so come over and say hi if you’re able to attend the event. He’s got some pretty spectacular demo scenery lined up. 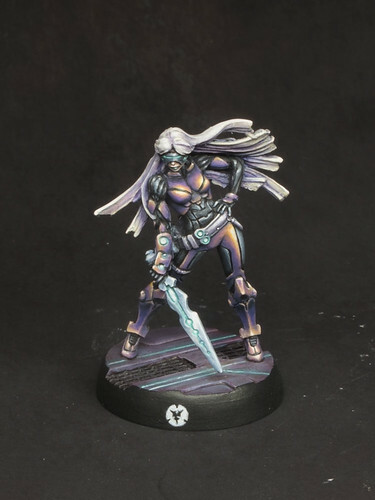 I’m trying to keep up a bit of momentum with my painting and posts here on the blog so now I present another Aleph mini for your viewing pleasure. 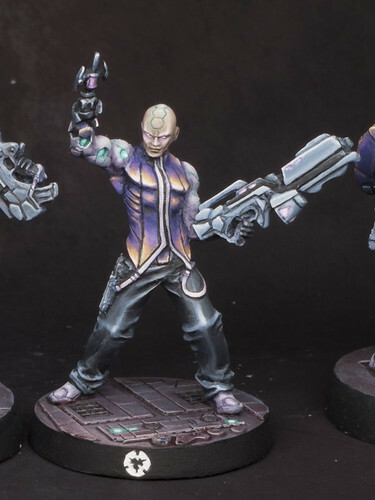 This time we have a Myrmidon Hacker, in the now familiar hot purple-orange scheme. Thankfully I’m still really enjoying painting those colours, which is a good thing considering I have plenty more Aleph minis to do! 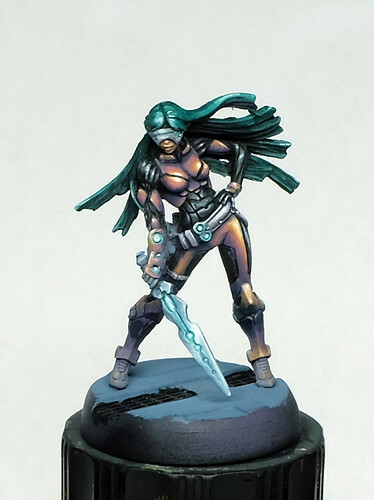 I shared a work-in-progress shot of her some time ago, which gives an idea how long I can leave some of my minis in a half-painted state! In that shot she had dark green hair. It was OK but wasn’t quite clicking for me somehow so I decided to go for the same silver/purple style I used on the Deva Functionary I recently posted. 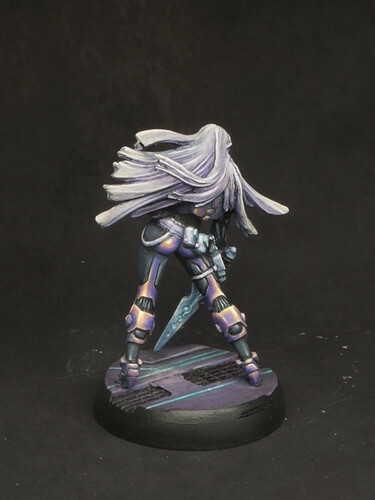 I think it gives her a bit of a wild witchy look, which I reckon is kind fitting for a Hacker: the space wizards if Infinity! Seeing as I’ve been neglectful of the blog (again) I figured I should make some recompense and backfill a little. 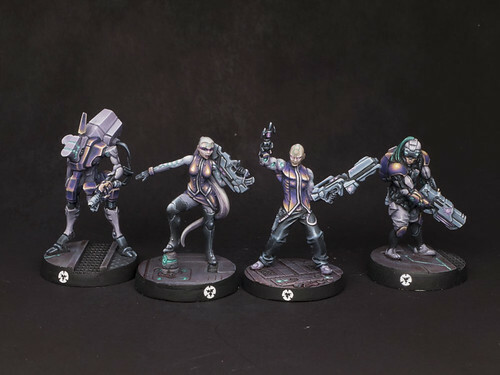 So, here are a few Infinity Aleph minis I finished in 2015 but hadn’t uploaded. From left to right we have a Devabot, two Deva Functionaries, and a Thorakite medium infantry. I’ve used the same colour scheme for the rest of my Aleph so nothing particularly adventurous here, though I’m rather pleased with the almost metallic looking sheen of the male Devas shirt. 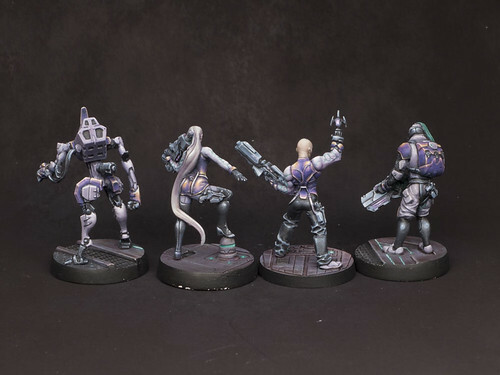 I could have spent a bit more time smoothing and tidying but they’re plenty good enough to stand alongside their squadmates on the table, I think. Just when you think this blog has gone the way of most blogs, along comes an update! So, I’ve not really been in a painting phase lately but I do have a few things to show that I’ve been working on this past few (six?) months. First up is a lovely little resin piece from a Kickstarted sci-fi tabletop roleplaying game called Fragged Empire. The RPG has an intriguing post-post-apocalyptic setting, taking place some time after a cataclysmic event and societies are in the process of rebuilding. Definitely encourage you to check it out: intriguing setting and the rulebook is a thing of beauty, with wonderful design and concept art throughout. 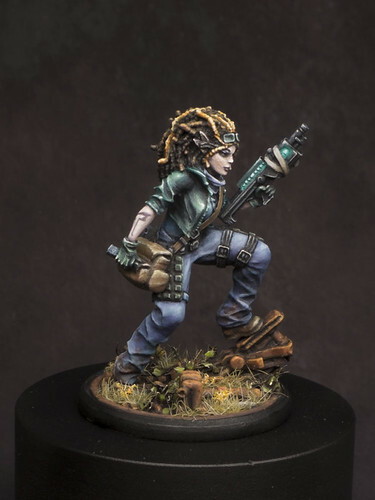 As I said it was a Kickstarter project and I think one of the stretch goals was the production of a miniature of one of the campaign characters: Rachel Swagger. I believe that the makers of the game are playtesting a tabletop skirmish game to go along with the RPG and have plans to make more miniatures. I hope that they do as I’d love to get my hands on some more of these resins.